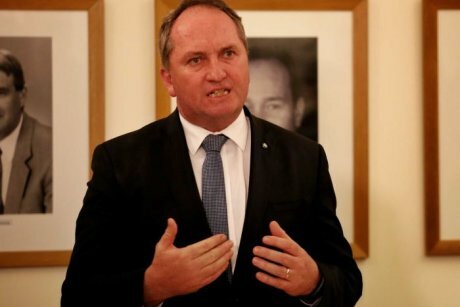 Deputy Prime Minister Barnaby Joyce has been declared ineligible to sit in Parliament by the High Court. There will now be a by-election in his seat of New England "on or around December 2", and the Government loses its one-seat majority. The High Court had been deliberating on the fate of six senators and Mr Joyce, a citizen of New Zealand by virtue of his father being born across the Tasman, after it came to light they each held citizenship in countries other than Australia when they were elected. Deputy Nationals leader Fiona Nash, One Nation senator Malcolm Roberts, former Greens senators Scott Ludlam and Larissa Waters have also been ruled ineligible to sit in Parliament. The court has ordered their seats be filled by a special recount of ballots. Senator Matthew Canavan can remain in Parliament after the court found he was validly elected. The court also found Senator Nick Xenophon was safe to sit in the Upper House, although he has announced he will leave federal politics to pursue a return to South Australian politics. Section 44 of the constitution bans dual citizens from being eligible for election. Speaking to the media in Tamworth, Mr Joyce said he respected the court's verdict and apologised for the inconvenience the by-election would cause. "I was always prepared for this outcome. I don't actually stand here totally surprised," he said. "I always expected that this was going to be a tough game." He said he hoped the writs would be issued today and the by-election could be held in early December and, now that he had renounced his New Zealand citizenship, he would nominate. Lawyers for the so-called Citizenship Seven had been arguing in recent weeks their clients, despite each having connections to other countries, should remain in Parliament. 0 Response to "Citizenship verdicts handed down by High Court, Barnaby Joyce disqualified"